Nosey the elephant has near-crippling arthritis. 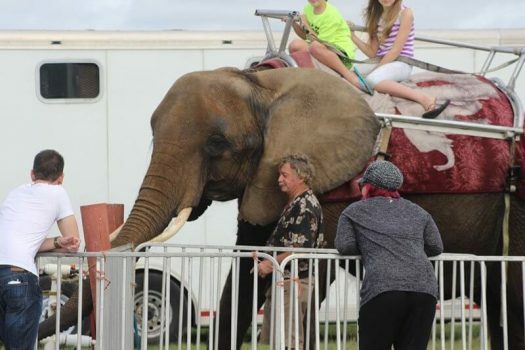 But that did not stop her handler from cruelly traveling the country with Nosey constantly, forcing the lame animal to give rides to customers at carnivals and fairs. Nosey was clearly distressed by her circumstances — the U.S. Department of Agriculture cited the handler nearly 200 times for animal-welfare violations. And yet the show, sadly, went on. The federal government intervened and seized Nosey, whom they “found tightly chained, confined in her own waste, and without proper shelter.” Nosey is currently housed at an animal sanctuary while a court decides her next steps. But while that case awaits a decision, New Jersey lawmakers have taken action. The bill, which was passed by an overwhelming 71-3 vote, is the second such bill passed by the state’s assembly. A similar law was passed in 2017, but was not signed into law by then-Governor Chris Christie. The new law, named in honor of Nosey, is expected to be signed by new New Jersey Governor Phil Murphy.